On a hill overlooking Washington’s Lake Sammamish, builder Donna Shirey of Shirey Contracting started building a model home of the future. The now-completed demonstration home is located just fifteen miles outside of downtown Seattle, and shows how the average homeowner can downsize his/her carbon footprint. All it requires is incorporating a few, simple, energy-efficient technologies. The Zero Energy Idea House began as Shirey’s idea. The goal? Demonstrate that a smaller home can be practical and generate nearly as much energy as it consumes. “Our goal is to crate a high performance, small, little jewel box of a house for people that want to downsize and have their house create energy,” said Shirey. That simplicity is a result of Insulspan’s ready-to-assemble system. RTA makes installation quick, easy, and especially helpful in difficult site conditions. In fact, the Zero Energy Idea House is a perfect example with its 40% slope. The 1,630-square-foot home is indeed, a home of the future. For one thing, it has photovoltaic solar panels for energy generation. It also features Energy Star lighting and appliances. Finally, these energy efficient products combine with a solar hot water heater. As a result, the estimated energy costs are only $40 per month. Shirey also reduced the overall environmental impact of the home using reclaimed wood, tile with recycled content, and a roof largely covered in vegetation. The latter is because vegetation limits storm water runoff. Finally, Shirey installed a rainwater collection system and low flow fixtures to conserve water. As a sponsor of the Zero Energy Idea House, Insulspan has helped Shirey gain exposure online and extend her message to more consumers. Her husband, Riley Shirey, who manages onsite operations for Shirey Contracting, credited Insulspan for providing exceptional products and service. See more single-family residential projects built with Insulspan SIPs here. 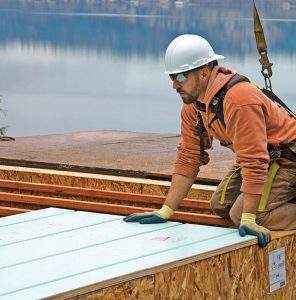 Read about achieving net zero with SIPs here.